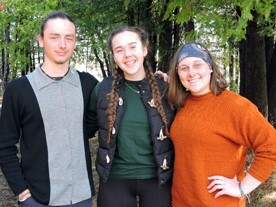 HOUGHTON – Three Houghton High School seniors attended the recent Lake Superior Youth Symposium in Ashland, Wisconsin, this past weekend and shared their experiences of the three-day event. Josie Ledgerwood, who will attend Michigan Tech to study natural resources, said the sessions of the first day of the three-day event were educational-based, which prepared participants for the field trips of the second day. After graduating from Michigan Tech, Ledgerwood said her plans are to join the Peace Corps before attending graduate school. “I eventually want to be an environmental lawyer,” Ledgerwood said. Addie Huckins said on the first day there were many speakers discussing several topics. During the field trip portion of the symposium, Huckins’ group visited tribal protected lands that were open to the public. Her group then visited a tribal fishery, where they were given a new insight to hunters and fishers overlapping with the tribe, “and how the conservation bubble goes over all of that,” she said. Huckins said she will work toward a degree in human ecology with a focus on marine science at the College of the Atlantic, in Bar Harbor, Maine, in the fall. Sal Sharp said the symposium was a valuable experience, because it provided an opportunity to study topics and locations outside the local area. Sharp said on the second day, the participants applied the skills and information learned at the presentations of the first day. An added educational benefit was that they could talk to experts such as fish biologists and fish hatchery staff. “You learn hands-on, and then you can go back and reflect on those things on the third day,” Sharp said. Sharp has been accepted to Fort Lewis College in Durango, Colorado, where he will study environmental studies.